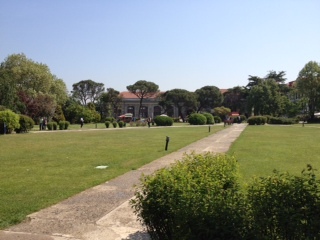 Between the 6th and the 12th of May this year, my colleague Esther Mijers and myself went on an Erasmus funded exchange with the History Department at the University of the Bosphorus (Bogazici University) just outside Istanbul. We had a wonderful and intellectually stimulating time, thanks in large part to the warm welcome that we received from our colleagues at the University of the Bosphorus, led by Dr Ahmet Ersoy, who is in charge of their Erasmus and other Exchange Programmes. It was also, of course, a marvellous opportunity to see the magnificent monuments and history-soaked topography of the great city of Istanbul itself. The University of the Bosphorus was founded by American missionaries in the 1863. Although it was handed over to the Turkish State in 1971, it still has strong links with the USA. Its courses are modelled on those of American Universities, and almost all of its courses are taught in English. This makes it a good exchange partner for the University of Reading. Esther and I were able to take part in classes, and we hope to be able to persuade some of our students to take advantage of the opportunity to spend a term there during their part two. 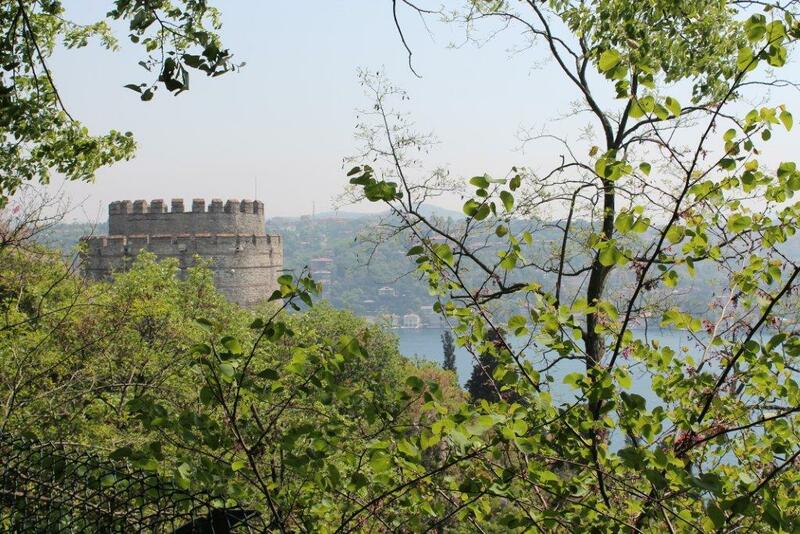 It is a beautiful campus, perched high above the Bosphorus just above the great early ottoman fortress of Rumeli Hisar. 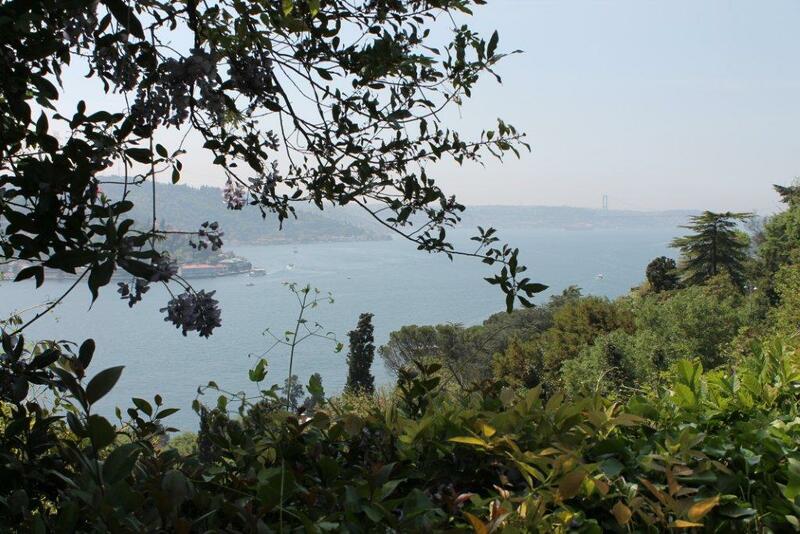 There are stunning views, through pines, acacia trees, judas trees and wisteria, of the fortress and the Bosphorus below, busy with ferries, luxury cruisers and vast container ships. Many of the buildings date from the late nineteenth or early twentieth century, when it was an American college, and the pretty green at the centre of the campus is reminiscent of an American Ivy League college. But dotted around the campus within the trees are some lovely nineteenth-century Ottoman wooden houses of the kind found all along the shores of the Bosphorus. Another clue that this is an Ivy League campus with a difference is the presence of dogs and, especially, cats. Presence is hardly the word. The campus is alive with them. They are well looked after. The animals are fed, splayed and neutered and the dogs are tagged. Even so, there were still plenty of kittens in evidence. The dogs doze in the sun; the cats pose winsomely and are adept at demanding food and attention from the susceptible student, professor or visitor. 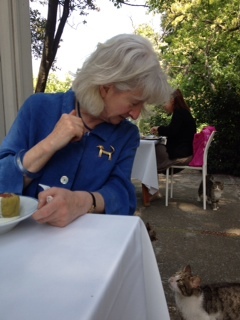 One of the cats regularly attends the seminar on Byzantine arts and architecture in which I took part. I thought this might be slightly apocryphal, and there was no sign of a cat in the first half of the seminar. Besides, it took place on the fourth floor of the Arts and Humanities building – a long climb for a cat. But by the half-time break, the cat was sitting on the fourth flight of stairs, and duly appeared, as clearly expected by all the students, to learn about the arts of the Crusader kingdoms in the second half of the session. The students at the back responded to his requests to have the door opened to leave ten minutes before the end of the seminar. It would be a challenging campus if one didn’t like cats. I thought they were adorable. The point of an Erasmus exchange is, of course, intellectual exchange with colleagues in another country. There was plenty of that. Esther and I sat in on courses on World History; I sat in on courses on Islamic architecture, took part in a post-graduate seminar on history of photography, and co-taught the session on the arts of Norman Sicily and the arts of the Crusader States attended by the cat; Esther taught two sessions, one to undergraduates, and another to postgraduates, on the Scottish Enlightenment, and attended a research seminar in early modern history. We both learnt a lot, even on courses where we took part as auditors. I hope, for instance, to be able to incorporate my enhanced understanding of Islamic architecture into my teaching here at Reading. Esther was reminded of the continued importance of the Enlightenment, even outside Western Europe, and will incorporate some of her new insights into her teaching. And there were lots of possibilities to discuss issues and ideas further over coffees, lunches and dinner. Intellectual exchange is always helped by delicious food. 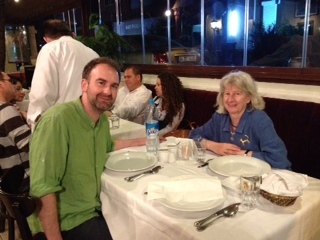 The food was indeed delicious, though I think that both Esther and I discovered that it is possible to eat too much baklava. 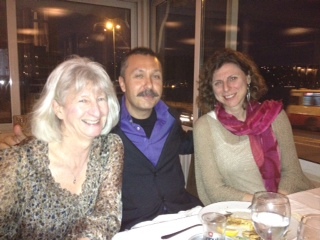 On the Thursday evening, we were invited to join the History Department for a wonderful meal in one of the delightful fish restaurants in one of the villages on the shores of the Bosphorus. Reading can provide very good food too, but we had to admit that when they come to visit us here at Reading, the banks of the Kennet are not quite the shores of the Bosphorus. For me, the highlight of the exchange was an opportunity to visit some of the remains of late Antique and Byzantine Istanbul with the Byzantine specialist, Dr Anestis Vasilakeris. He explained the topography of the Byzantine city to me – it always makes such a difference to appreciate it on-site. The queues at Hagia Sophia were too long, so we explored Justinianic architecture at Sts Sergius and Bacchus instead, then had lively discussion of the differences between Byzantine and Western iconographic traditions in front of the wonderful Palaeologan paintings and mosaics in St Saviour in Chora. Palaeologan work is Anestis’ own area of special research, so it was a real privilege to be able to see such a complex iconographic programme with an expert. My own research is on Capetian France, so I was particularly keen to see remains dating from the brief period between 1204 and 1261 when French and Flemish aristocracy controlled the Byzantine Empire. Anestis took me to visit a small chapel attached to the Kalendarii Jami, decorated during this period with paintings showing the life of St Francis of Assisi, and dating from very soon after St Francis’ death, and his canonisation in 1228. This chapel is not normally open to the public. But Anestis brings his classes to see it, and knows the Imam of the mosque, who very kindly allowed us to go in to see the chapel. 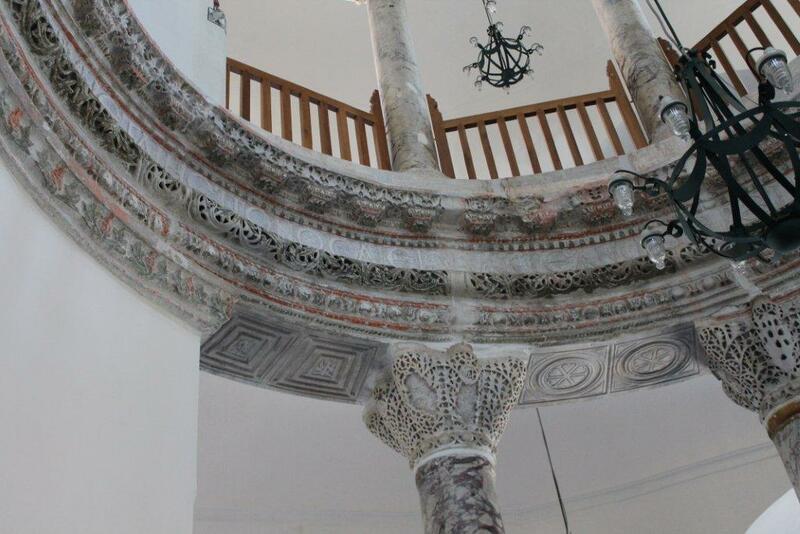 Esther is an early modernist, so she concentrated on Ottoman architecture, spending an entire day exploring the Ottoman palace complex of Topkapi and the European quarter of Istanbul, with its many French influences. Together, Esther and I visited the two great religious monuments – Byzantine and Ottoman – of the city: Hagia Sophia and the Blue Mosque. The scale and magnificence of both buildings was breathtaking. 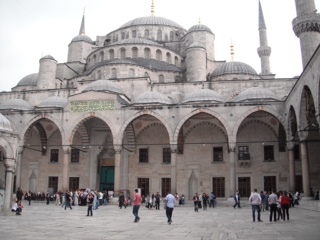 I can’t wait to return to Istanbul. 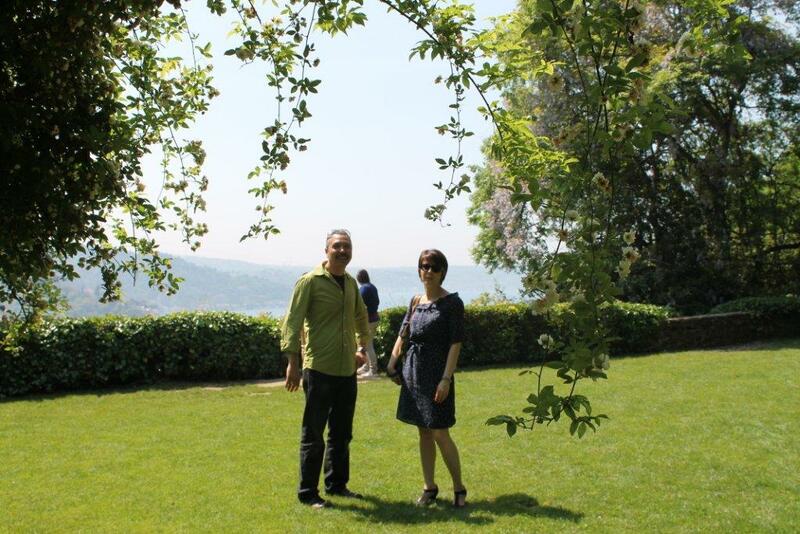 In the meantime, Esther and I and our colleagues here in the History Department are planning to invite staff from the University of the Bosphorus to come on an exchange visit to our department, and we hope to arrange student exchanges in both directions too. We have tame ducks rather than cats, and our views of the Thames Valley can’t rival theirs of the Bosphorus, but Reading University has a beautiful campus too, and the Department of History looks forward to welcoming colleagues and students from the University of the Bosphorus here at the University of Reading before too long.